â€œWhile some may see them as the crazy ones, we see genius. 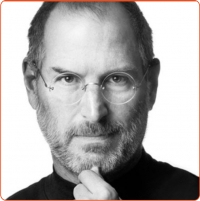 Because the people who are crazy enough to think they can change the world, are the ones who do.â€� (Think diffrent-by Apple). So here is to the crazy ones, Steve Jobs! Thank you and R.I.P.